Tom Anderson shared four lessons he has learned along the way with club members as part of his introductory talk. Tom and his wife Pam live in River Falls. They have two adult daughters and four grandkids. He grew up in Afton, near St. Peter’s Lutheran church. The church was the social center and hosted many community groups and events, including youth baseball, 4H, Boy Scouts. The family would “go to town” in Hudson, across the then two-lane Hudson bridge. Hudson had gas, groceries and animal feed. Tom remarked that he always thought that the bridge was one of the most beautiful sights around. And here was the first lesson: Blue bridges are all around, I just need to remember to look for them. After attending Stillwater High, Tom majored in animal science at the U of M, and received his bachelor’s degree. It was not long before he noticed a poster on the St. Paul Campus library recruiting for a Peace Corps tour. So, it was off to Marrakech, Morocco. Tom was the ag advisor to the coop there, supervising the cultivation of olive seedlings, orange seedlings, small grains, barley, rye and wheat. The farm had sheep and cows as well, but space and power limitations made it difficult to maintain a dairy herd of 350 cows. The idea was to raise calves to sell to local farmers and thereby raise the genetic merit of the surrounding herds so they could increase their productivity. With an unstable power grid, the cows were finding it difficult to relax enough to produce a good quantity of milk. So, the coop decided to “farm” the cows out to local families, who would care for the animals and help milk production go up. It was a success, and Tom learned his second lesson: Focus on the people, not the machine. As he returned home to the states, Tom married Pam and they lived off Stageline Road on the outskirts of town back then. Because of his time in the Peace Corps, Tom wanted to continue in his role as an Ag advisor, so he did some research and decided Wisconsin was where it was at. He knew he needed an advanced degree to compete, so he set about getting that at UW-River Falls. As he completed that degree, he was offered a position as Instructor of Agriculture Education. He totaled his influence: 43 students counseled, none incarcerated. Soon it was time for Tom to begin an extension career as Bayfield County Ag Agent. He enjoyed the area, including the beautiful harbor and ice formations in the winter, the Ashland Ag Research Station, and working with farmers from Douglas, Bayfield, Ashland and Iron Counties. It was a time of changing technology, so Tom’s lesson from Bayfield encompasses that: Remember that I’m the one that dumped the dumb terminal in the milk tank. Finally, Tom moved on to Shawano County as part of the UW Extension, recruited as someone who really liked to work with dairy farms and diary families. Tom noticed that farmers were very particular and careful about how they took care of the milking herd. But as to their personal health, not so much. Tom helped launch a rural health initiative, emphasizing that dairy farmers are most valuable link as the most important industry to the economy. As part of the initiative, nurses or medical practitioners go on the farm and provide care that would normally occur in a wellness visit at the clinic. This would include a health risk assessment, measuring body mass index and body fat, blood pressure and blood chemistry screenings. The staff would then provide health coaching and referrals. 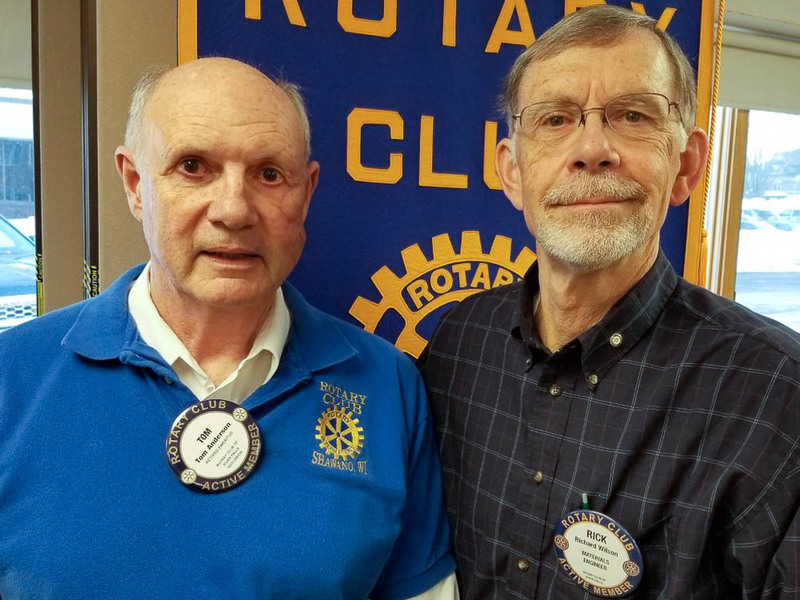 The rural health initiative was dreamed up by Tom and two other Rotarians. And the lesson is that Rotary has an impact far beyond the “official” rotary programs and projects. Rotary programs, like trail clean up, working at local festivals and reading programs.